When it comes to sending a parcel to Greece, there’s no better choice than DPD Local Online. Our extensive European courier delivery network means that we can arrange your postage to Greece quickly and at a price that meets your budget with no loss of service. An ancient country with an abundance of history and traditions, Greece is one of the sunniest countries in the world and one of the most popular destinations for tourists. In summer it’s not unusual for the number of tourists to outnumber the Greeks more than twice. Whether you want to send a parcel to Athens or to one of the beautiful Greek Islands such as Santorini or Mykonos, our expertise in international delivery will make sure we get your parcel to Greece safely and within the timeframe you expect. To arrange a courier delivery that is as cost-effective and hassle-free as possible, book your postage to Greece with DPD Local Online today. Delivery within 8 working days. Greece is a member of the European Union, which means there’s no need to worry about international customs duties when posting to Greece from the UK. Postage to Greece start as low as £24.00 when you book your delivery through DPDLocal-Online. Plus, we have the widest range of couriers of any UK comparison site, ensuring that you’re always able to find the best deal on cheap parcels with us without having to shop around. There are only a few variants between the Greek address format and the British, one of which being the capitalisation of the recipient’s last name. Need an example? 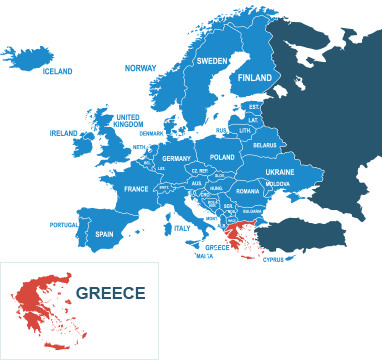 The Universal Postal Union has put together this addressing guide for Greece for you. For more information on what can and can’t be imported into Greece, get in touch with HM Revenue and Customs. You can also refer to our prohibited items page for information on goods not permitted for handling by couriers.